Your first visit is simple and on average takes 45 minutes. You will meet with your doctor in a comfortable consultation room. The doctor will talk with you about your health concerns and answer any questions. The doctor will take a detailed history of your health issues to help determine if yours is a Chiropractic case. Next, you will fill out some short forms so the doctor has the information necessary to start you on your Chiropractic journey. Next, you will have a complete exam that will include special tests. These tests help determine where your problem areas might be and how the doctor will address them. The tests include: two computer scans that test the muscle tension as well as the temperature on either side of your spine. When your body is healthy it should be in balance. Long gowns and shorts are provided for these examinations. To locate potential problem areas, misalignments (vertebral subluxations). To rule out other pathologies (diseases). X-rays are like a road map to your spine and helps your doctor to be specific for your individual needs. To see is to know! We do not want to guess when it comes to your health. After the doctor has had time to study and analyze all the information and put it all together they will sit down with you and show you what was found. At this time they will also discuss what will need to be done to correct your problem. 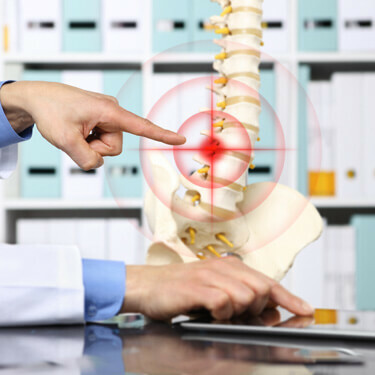 After you have had time to ask any questions about your report, the doctor will then deliver any necessary spinal adjustments to begin your healing process. Our focus is to be as specific, precise, and accurate as possible, addressing only the problem areas (areas of subluxation). Great care is taken to ensure a mechanically correct position and precise thrust to provide the most accurate and painless adjustment possible. Your doctor uses five indicators that show where your nerve interference is that visit. These indicators include: visualization (we observe for postural changes, visual signs of swelling or muscle spasm), x-rays (the x-rays are viewed every visit to be specific for each individual) static palpation (which is simply feeling along your spine for tenderness, swelling and other abnormalities), motion palpation (which is bending your spine to look for sings of fixation), instrumentation (we run a nervoscope which feels like two fingers gliding down your spine, to locate areas of temperature imbalance). Temperature changes can indicate swelling or lack of blood flow to an area of the spine. The doctor will run the nervoscope to detect any nerve interference and to observe the differences from the previous adjustment. The doctor will adjust the necessary areas of subluxation and give you any further instructions. It is our goal, as Gonstead Chiropractors, to restore and maintain optimal health by locating and correcting any interference to the nervous system caused by vertebral subluxations. Questions? Concerns? Give Higley Family Chiropractic a call now and put your mind at ease.